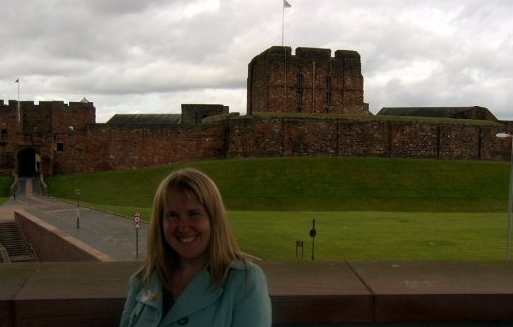 Two or three years ago, I visited Carlisle Castle the squat and brutally functional stone fortress, near to the Western end of Hadrian’s Wall and just back from the modern Scottish Border. My half-Scottish soon-to-be wife, Lisa and I joined one of the free guided tours. Amongst our fellow visitors were a family with the menfolk in Rangers football tops invoking (possibly unfair) assumptions about their allegiance and from over heard conversations there was a mix of Scots and north country English in the group. Our guide was one of those fine volunteers often found at English Heritage properties, a lean, grey middle aged Cumbrian with a clear voice and a lot of knowledge of his subject. He told us of the castle’s construction, its defences, Mary Queen of Scots imprisonment and The Duke of Lancaster Regiment museum. But as we were leaving the courtyard for the keep, I was puzzled by the omissions from his talk. “Where is the door which Kinmont Willie escaped through?”, I asked. Kinmont Willie Armstrong was possibly the most famous of the Border Reivers. Between the late Middle Ages and James IV of Scotland taking the English throne notorious “Reiver” families from both sides of the border carried out cross-border (or sometimes domestic) raids for livestock, goods and hostages, running protection rackets and to carry on longstanding, violent feuds. With relationships between the two nations oscillating between wary fractious peace and occasional war during the period the attitude to these raids by both governments varied from tacit complicity to occasional crack down. Kinmont Willie carried out some of the largest raids (or “Roads”) or the period, leading hundreds of horsemen across the border taking prisoners and stealing, over his career thousands of English Cattle. In 1596 he was captured, probably illegally and certainly against border custom when returning from a “Day of Truce”, and after a long chase imprisoned in Carlisle Castle. The event was immortalised in a gloriously pro-Scottish Ballad which romanticised the raid and is the cause of much of its enduring fame. But back to my tour guide. When I asked my question, he broke into a broad grin. He then went on to give a brief account of Willie’s escape and English Heritage policy apparently satisfied by my enquiry, we chatted through the rest of the tour and beyond of Roads, Hot Trods and border skirmishes, both delighted to have found someone with a shared interest. Lisa smiled indulgently. This contrasts with the attitude across the border in Scotland. We later visited Hawick, where after the catastrophic defeat of the Scottish army at Flodden in 1513, the “callants”- the youths of the town (and most probably Reiver’s sons), fought off an English raid and captured a flag. In Hawick this event has spawned an impressive equestrian statue, a local society which commemorates the capture annually with costumed riding events, and the town is replete with references to the Callants on sign boards and in shop windows. Nobody need to ask a question in Hawick for the tale to be told. George McDonald Fraser (creator of Flashman, peerless storyteller and Anglophile Scott whose only work of historical non-fiction “The Steel Bonnets” is an excellent history of the reivers) in his doumentary “The Debatable Lands” shows a number of Scottish Border Festivals. In Jedburgh, a tale is told Scottish triumph against the odds in the face of English betrayal. Most feature a liberal dressing of kilts, plaid and tartan, which a Scots reiver would probably never have set eyes on, let alone understood as the symbols of his nation. The narrative is certain- Scottish pluck and defiance in the face of English perfidy and aggression. Of course, this image is at best half true. The English were indeed perfidious and aggressive and the Scots were indeed victims, but in almost exactly equal measure the reverse was true. To argue whether the Scots or English reivers were worse than the others is at best splitting hairs. This was a shockingly violent time and place and the weak on both sides of the border suffered for it. It Scotland, the reiver years have been mythologised and politicised. The Scottish national identity draws strongly on images of strong, honourable, defiant individual victims of English bullying, which the ballads of the borders provide plenty of. Add some tartan plaid and the reiving tales (or at least half of them) serve modern Scottish cultural and political nationalism well. My point, however, is not to criticise this slightly squint version of border history. History frequently, even inevitably, has been used to build or reinforce our perceptions of who we are. The English have, perhaps practiced this more than most in the past. It is far preferable to trying to ignore the frequently violent side of the shared, complex and fascinating Anglo-Scots history in a kind of strangely misplaced extension of post-colonial guilt. I’d rather half the story were told than we pretend that nothing happened. I’m not one to exclaim “it’s political correctness gone mad” with Daily Mail bluster, nor am I one who claims that the English should adopt a chest-beating nationalism to bring balance to the Union. My concern is not that if border history is left to the Scots it will be rather anglophobic- it is their history to use as they will. Ignoring important bits of history with the pretty shabby (and almost certainly unjustified) excuse that it may offend bothers me far more. This is, to me, is a very succinct expose of the present situation in Carlisle under English Heritage or is it true embarrassment of the fact that five Scottish Border Reivers entered Carlisle castle with ease, the second strongest fortress on the Borders. Help from the English Grahams and friends of Thomas Musgrave ( an Englishman) who were already in there on that fateful night in 1596 seems to irk the present day English even after four hundred years. To balance the matter, one hundred yards from the castle, in Tuille House, there is an excellent synopsis of the Reivers. No problem there in at least acknowledging that the Border Reivers did ride the land for almost three centuries. Your article encompasses the wider situation with logic, ready commitment and a certain aplomb that seeks serious dialogue. Thanks for your kind words, Tom. It is a pleasure to find someone who appreciates the article. I’m not convinced, however, that the reason for English Heritage’s policy would be embarrassment at the English incompetence and perfidy – the whole cross border conflict was off limits it seems. Pinkie Cleuch, Solway Moss and even Flodden are barely remembered in England, despite being ideal candidates for nationalistic chest beating. The “triumphs”, if one wants to see them through the a partisan lens, are as forgotten as the humiliations, whether small ones like like Kinmont Willie’s escape or big, complicated ones like the Bishops’ Wars. I can understand that the near universal Unionism of the English establishment over the last couple of centuries may have considered it convenient to ignore Anglo-Scottish conflict, but in these more enlightened times we should be seeking to understand our history, not censor it.